All transactions are safe and secure with a reliable history in online purchasing behind each of our associates. Buy the Lost Quotes Collage t-shirt to own Lost clothing and merchandise. The Lost TV show left behind many noteworthy quotes and images from the episodes. 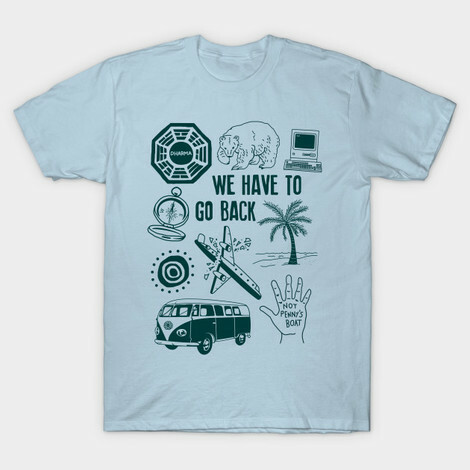 This design features two of the most memorable quotes, "We have to go back" and "Not Penny's boat." An instant conversation starter, this design will have fellow fans pointing out their own favorites. Pair it with a Bad Robot t-shirt which is a favorite among fans of Lost and JJ Abrams projects in general. In addition to the Lost Quotes Collage tee above, browse the Lost Clothing Gallery for more apparel like men's and women's clothes, kids shirts or hoodies.